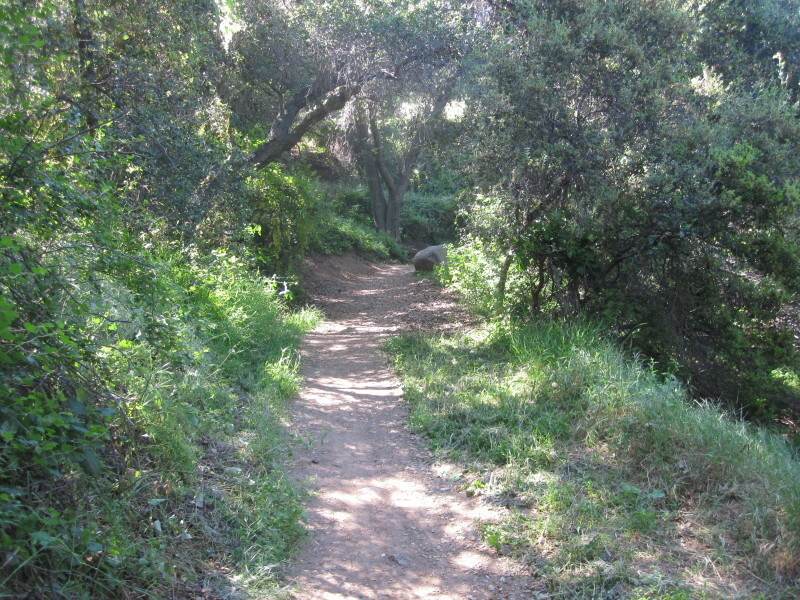 Colby Trail is a prime example of the fruit seen from various communities along the foothills as they endeavor to redeem open space and provide public access to natural environment. Over the decades the hills above Glendora had been increasingly planted with houses. In 1989 a developer had designs on building homes on some flat benches on the hillside north of Loraine Avenue. 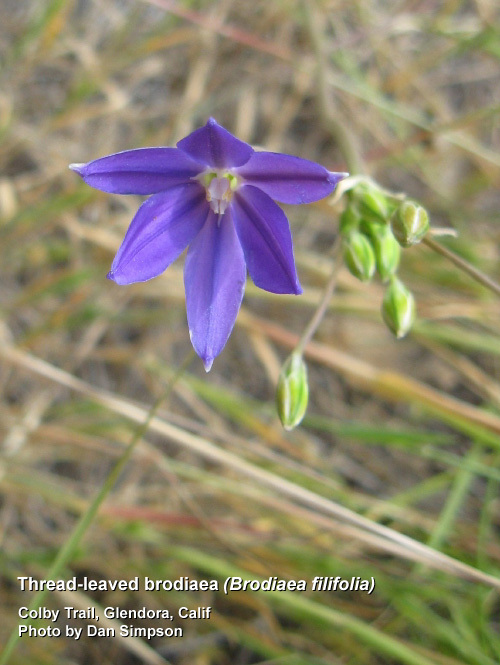 In the process of preparing an environmental impact report, a botanist discovered that the site was host to the rare thread-leaved brodiaea (Brodiaea filifolia). Because the plant is an endangered species protected by both the State of California and the Federal Government, the proposed development could not go forward. 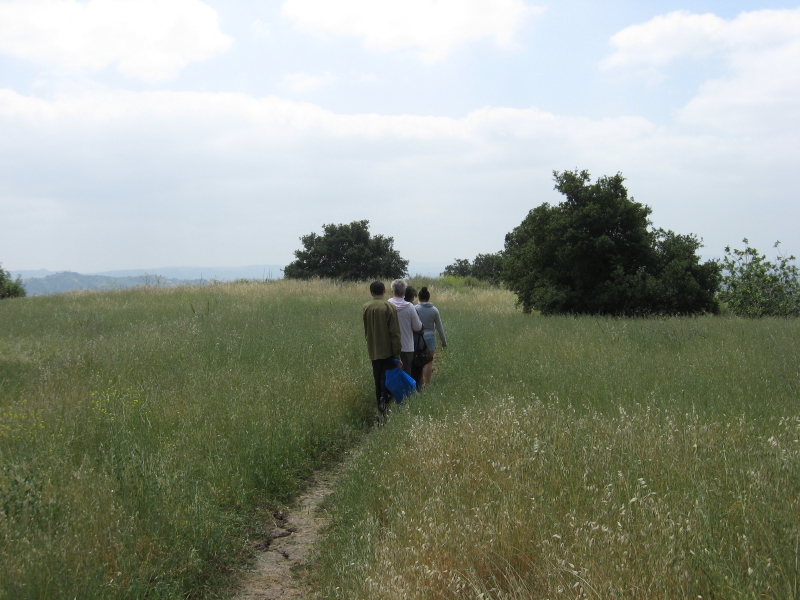 In this context, the Glendora Community Conservancy was founded, acquired grants, and purchased the land, preserving and protecting the brodiaea reserve and surrounds as open space in perpetuity. Today Colby Trail is not something that an avid hiker would want to drive very far to access. Its network of trails provides a maximum loop hike of only about 3 miles. But it's a fine local trial for walkers, joggers, doggers, bicyclers, and even local hikers who want a good workout between real hikes. 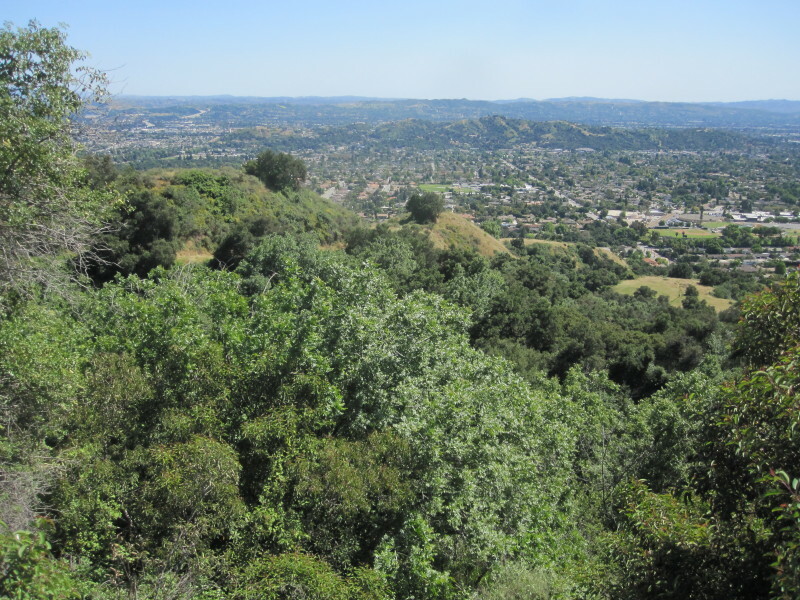 And in the springtime after some good rains, the lush green hillsides, beautiful wildflowers, and stunning views of the communities below and mountains beyond make this trail a real winner. If you want more challenge, you may extend your hike by using Upper Colby Trail to climb Summit 2583' for an additional 2.2 miles round trip and 1,000 feet in elevation gain. The Colby Fire - Early Thursday morning, January 16, 2014, three idiot males started an illegal campfire near Upper Colby Trail. Wind kicked up and the campfire irrupted into a wildfire which destroyed more than 1,700 hundred acres of mountainside above Glendora and Azusa. Officials dubbed it the Colby Fire. Damage from the fire forced the closure of Colby Trail for nearly 16 months. Much of the mature chaparral around Colby Trail was incinerated leaving bare mountainsides which will take years to recover. Thankfully the woodsy riparian area at the lower end of the trail was saved from the fire along with the east-facing slopes around Colby-Dalton Trial. See my Colby Fire blog post. This hike is best done in the winter or spring when the hills are green, the temperatures are pleasant, and the air is clear. The spring offers an array of wildflowers. 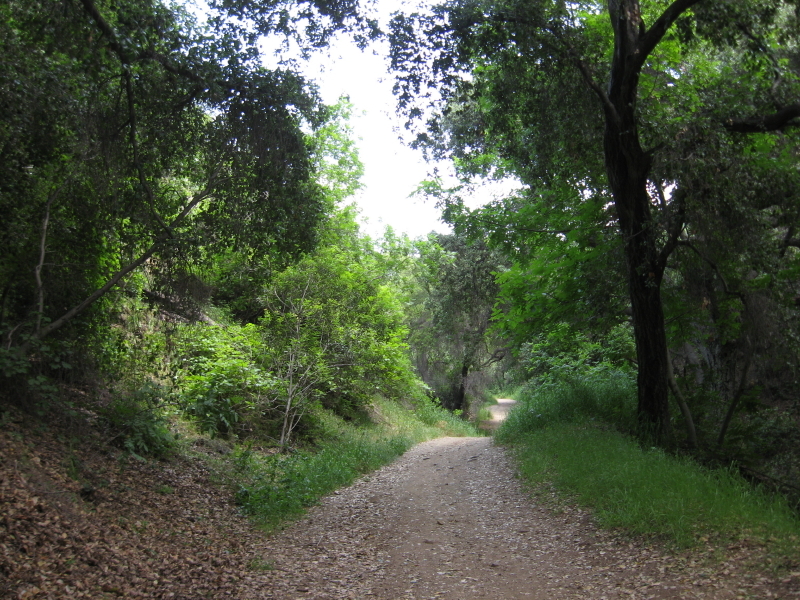 There is little shade in the upper two thirds of the route, so this hike can be punishing on a hot summer day. If you go in the summer, try daybreak or early evening. Early in the summer the "June gloom" (marine layer, coastal fog) can make nice walking conditions but also can greatly obscure your views. See Seasons of the San Gabriels for a detailed description of minding the seasons. In Glendora travel to Sierra Madre Avenue (which runs east and west along the foothills). Turn north (toward the mountains) on Loraine Avenue (which is about a half mile west of Valley Center Avenue and about 1.5 miles east of Grand). Drive about a half mile on Loraine until it deadends at the marked trailhead in a residential area. Park on the street and please be respectful of those who live there. Trail hours are daylight to dusk. Walk northeast through the stone gateway to begin your hike. Your first stretch of trail enjoys a riparian plant community nourished by a seasonal creek and shaded by sycamore, oak, bay, and black walnut. After the first hundred yards the trial begins to ascend aggressively. After 0.22 mile you reach a four-way junction. To the left (west) through the stone gateway is the brodiaea reserve (see below). On the right, the trail heads east toward the "berm" and the lower part of the loop. But continue straight to follow Colby Trail. Oak-lined Trail - Lower section of Colby Trail. View Large Image. In a couple minutes the trail cuts to the right, crosses the stream bed and climbs east. Within a minute you begin to get your first good views. As your round the bend to the north you look southeast and see where the trail to the "berm" connects with the paved service road  that is a route for one of the loop options (see below). The trail contours back to the north and in a few more minutes you reach a gate in a chain link fence on your right (east), 0.47 mile from the start. This route doubles back and connects to the paved service road you saw earlier, connects with the "berm" trail, and arrives back to the earlier four-way junction. But stay on the main trail as it cuts back to the left (west) and climbs to flat area on the ridge providing nice views west. The trail turns north. As you traverse this stretch of trail, notice the rock in the road-cut on the right. 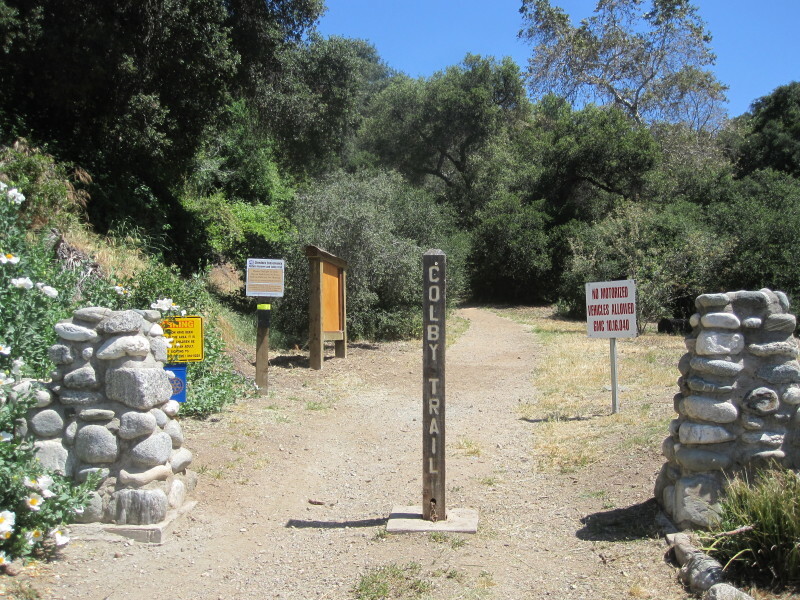 In a few more minutes you reach another trail junction, which provides another loop option using Colby-Dalton Trail, but stay on the main trail for another 260 feet to reach the top end of Colby Trail as it arrives at Glendora Mountain Road. If you turn left on the road and walk a few steps over to the bank, you are rewarded with splendid views of the surrounding foothills and the communities below. To complete your 1.42 mile hike, return the way you came. 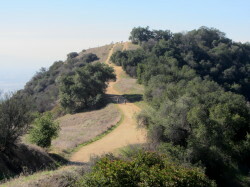 From the four-way stop 0.22 mile up the trail, turn right (east). Follow the trial as it crosses over the creek. 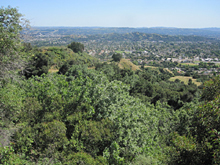 In a couple minutes you'll see a spur trail taking off to the right (south) which leads past a small grove of oaks and unto a broad, flat ridge with splendid views over the communities below. Continue straight past the spur trail as the trail bends north and ascends the "berm," which essentially is the built up road bed. Turn right (south) and walk across the wide turnout to the paved service road. From here you have two options. Turning left, the road becomes dirt, contours to the north and west, ascending to meet the chain link gate on the mail trail. A second option is to turn right, descending the paved road as it bends around the hillside heading east then northeast. Keep bearing left and ignore spur roads that cut right and left. Pass through a vehicle gate then begin to ascend north to arrive at the dam. Continue to follow the road, now dirt, as it descends along a chain-link fence adjacent to the flood basin. Near the bottom you'll see a single-track trail bearing left. 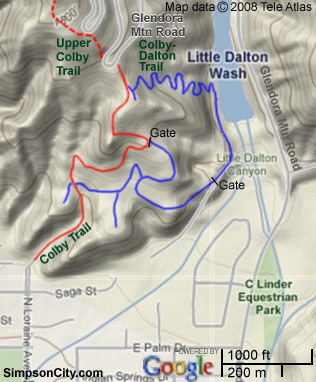 This is Colby-Dalton Trail and is your route. The trail steeply climbs westerly through mature stands of oak and rich vegetation. 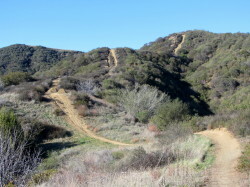 After negotiating 14 switchbacks the trail arrives at the junction with the main Colby Trail, 260 yards shy of Glendora Mountain Road (right, north). There's a spur trail that bears left (south) out over a board ridge 100 yards to a view point. But to descend Colby Trail, veer right past the sign post then an immediate left onto the main trail (south) and descend 0.66 mile to the trailhead. Of course another option is to climb Colby Trail 0.66 mile to just short of Glendora Mountain Road and follow this Colby-Dalton Trail back. To extend your hike as an adventure, you may continue north from where Colby Trail meets GMR and climb another 1,000 vertical feet and 1.1 miles to Summit 2583. This single-track routewhich is more of a use path than a formal trailis known as Upper Colby Trail and is popular with mountain bikers. 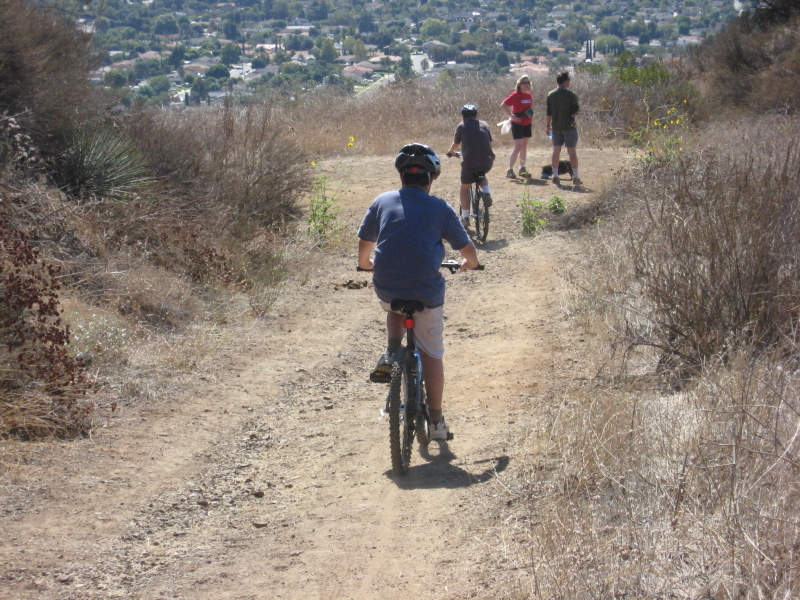 There are several places that are pretty steep, with the toughest section near the top. Some sections are badly eroded by bike traffic and the trail is literally a trench. Upper Colby Trail - View north on upper section. View Large Image. Description: From the upper terminus of Colby Trail at GMR (near mile marker 12.42) turn left (west) and walk along the road around the hairpin bend about 75 yards and notice a steep path on the left heading north up the mountainside. This is your route. It gets quite steep with loose, rocky footing climbing 140 vertical feet in 0.07 mile to another hairpin bend on GMR (if you want to skip this section you can walk about a half mile up the road and pick up the trail the near mile marker 11.90). The route continues on the left under the oak trees and heads west then bends north up the ridge. Enjoy some splendid scenery and amazing clear-day views, but keep in mind that there is virtually no shade en route, so it can be quite punishing on a hot day. Follow the undulating ridge 1.03 miles to Summit 2583. A concrete foundation is all that is left of what used to be a radio facility. You are treated with a fine 360-degree panorama. Return the way you came, but be especially careful on the steep sections; they are more precarious going down than up. Azusa Peak (2081') - View west from Glendora Ridge Motorway. View Large Image. If you are up for even more adventure, you may plan a one-way hike starting on the Colby Trail, traveling west on Glendora Ridge Motorway, and descending Garcia Trail (about 6.5 miles). 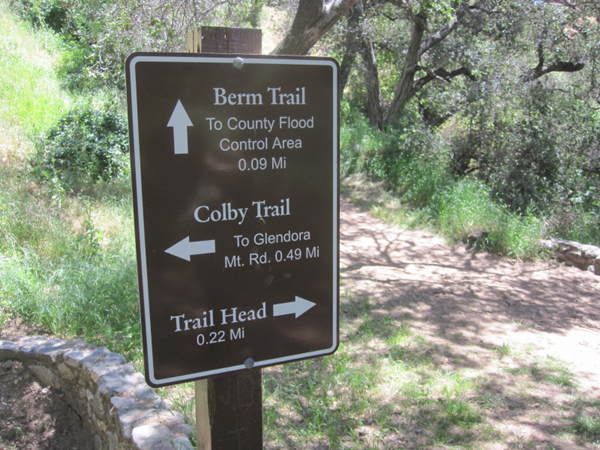 You would either need to coordinate a car shuttle or walk the 3.0 miles along Sierra Madre Blvd and Loraine back to Colby Trail trailhead. See my Garcia Trail Hike Description. Description: From Summit 2583 descend north 0.14 mile to Glendora Ridge Motorway. Turn left (west) and walk along the wide dirt. In 2.2 miles, where road bends northwest, you may veer left on the use path and in about 3 minutes bag Glendora Peak (2596'). Back on road, the route continues northwest and shortly rounds a hip and heads southwest. 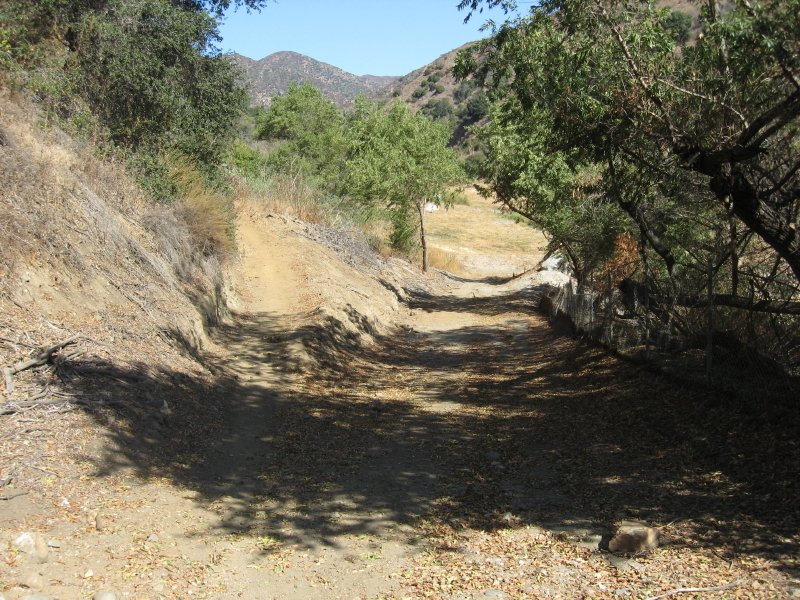 In 0.75 mile from the Glendora Peak junction, a use path bears left and climbs 0.08 mile to the summit of Azusa Peak (2081'). 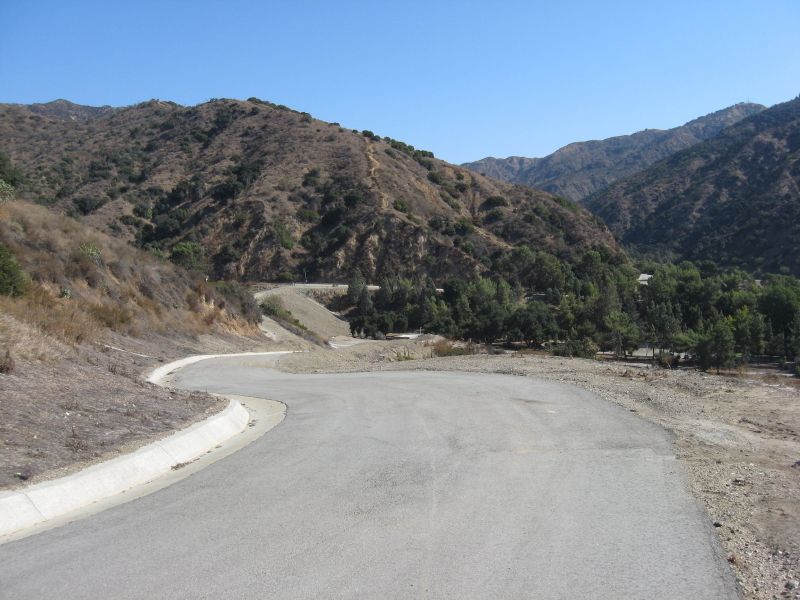 You may climb Azusa Peak and descend the west ridge to regain the road, or your may proceed west on the road as it traverses the north flank of Azusa Peak. As the road passes the peak, you will see a concrete water-collection slab on your left. In another 50 yards notice a path that bears left down the mountainside. This is Garcia Trail. Follow the well-traveled footpath 1.2 miles to its trailhead at the fire station on Sierra Madre Blvd. 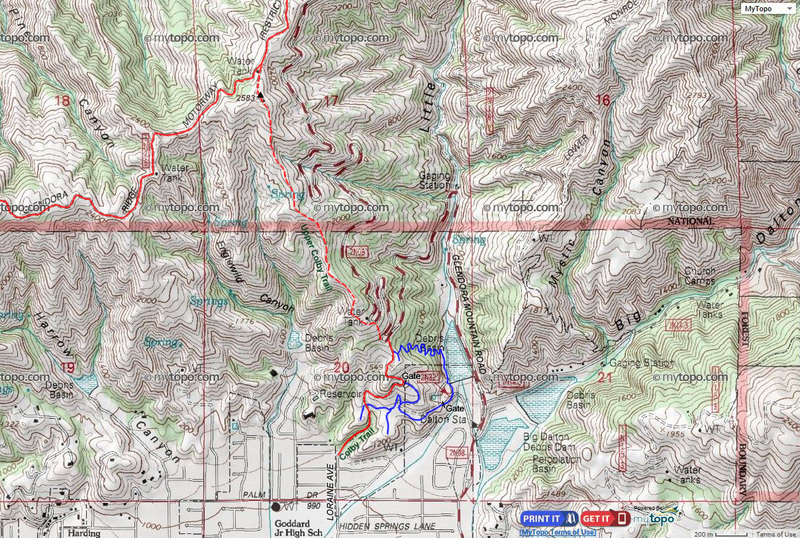 See my blog post for an account of the hike in reverse: Garcia Trail to Colby Trail Hike - December 13, 2013. The endangered thread-leaved brodiaea (Brodiaea filifolia) prompted the action of preserving all this area around Colby Trail as undeveloped. To view the thread-leaved brodiaea, when you arrive at the four-way junction 0.22 mile from the beginning of the trail, turn left (west) through the stone gate and follow the path to the grassy open space. The brodiaea is usually in bloom from early May into July. The six-pedal blossom is dark purple to magenta and about 1/2 inch in diameter. The plant grows up to 12 inches or more. The leaves are grass-like, thus the name, thread-leaved (the name "brodiaea" is in honor of the Scottish botanist James Brodie). This native plant is in the lily family (Liliaceae) and the leaves emerge from a bulb, usually beginning in January. 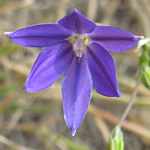 Brodiaea filifolia is the official flower of the City of Glendora. If you visit the brodiaea reserve, please stay on the trail so as not to damage the plant. Traffic - Looking south from upper section of Colby Trail. View Large Image. Poison Oak - There is a lot of this obnoxious plant along the route, so be careful. Learn about poison oak here. 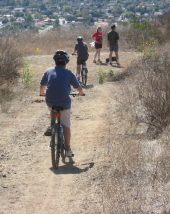 Bike Traffic - These trails are popular with bicyclists. Technically pedestrians have the right of way, but common sense would dictate that you step aside and give them plenty of room to safely pass as they are blazing down the trail. This page was last updated January 20, 2016.